A March 1999 article by the late Emru Townsend, a Montreal-based animation and technology writer who worked at Softimage for awhile. Frédéric Back, in his 1993 film The Mighty River, traced the history of the St. Lawrence River (St-Laurent, to us Quebecers) in eastern Canada, as it flowed from Lake Ontario out to the Gulf of St. Lawrence before emptying into the Atlantic. His majestic film spoke of the aboriginal people who lived off the land, the fur traders, the settlers and the modern-day Canadian inhabitants. But somehow he forgot about the digital animation houses: no less than four significant players in the animation and effects industry straddle Lake Ontario and the St. Lawrence itself. Tony de Peltrie (1985) can be considered the godfather of all the CG action in the great white North. © Pierre Lachapelle, Philippe Bergeron, Pierre Robidoux, Daniel Langlois. Three of these companies happen to share common ancestry, in the form of a melancholy pianist by the name of Tony de Peltrie. De Peltrie, of course, does not exist except virtually. 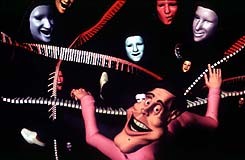 When the eight-minute short film Tony de Peltrie was presented to the world in 1985, the eponymous character was widely considered the first computer-animated character to truly express emotion through his face and body language. 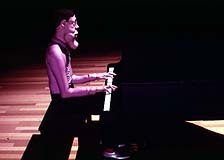 Tony de Peltrie was the brainchild of Pierre Lachapelle, Philippe Bergeron, Pierre Robidoux and Daniel Langlois at Université de Montréal. The irony is that in the short, Tony sadly reminisces about his long gone glory days. As it turns out though, his true legacy was yet to come. Taarna’s The Boxer. © Taarna Studios. Closest to the St. Lawrence, in the area of Montreal known as the Old Port, Taarna Studios — named after the scantily-clad warrior that graces every Heavy Metal poster — goes about the business of giving animators the necessary tools to create life on the screen. As it happens, Taarna was the name given to the software that Philippe Bergeron used to bring Tony de Peltrie to life. In 1994, their Digits ‘n Art (DnA, for short) subsidiary was born, specifically to market flesh, a 3D paint software application, and LIFEsource, a complete motion capture system. Among their numerous clients are Rhythm & Hues, Bandai, and NHK. flesh is also a recent addition to Mainframe Entertainment’s stable, where it handles the paint and texture-mapping chores on Beast Wars. Taarna’s playground for beta-testing their software is The Boxer, a CGI film which seems to feature a boxing match between two seemingly mismatched opponents. “Seems to be” is the operative phrase, since production on the short is very secretive, though the impressive one-minute, forty-second trailer to the film has won several awards in recent years. 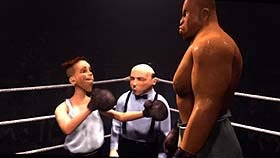 Directed by Pierre Lachapelle, The Boxer was originally to be a 20-minute film slated for film and television outlets; it’s now destined for large-screen IMAX theaters, with a running time of 40 minutes. 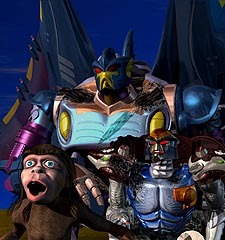 Mainframe’s Beast Wars is produced in Canada as well as using Canadian-made software. © Mainframe Entertainment. Daniel Langlois, another Tony de Peltrie co-creator, founded SoftImage in 1986, but it was 1993’s Jurassic Park that made the world sit up and take notice. Remember the gallimimus herd stampeding as they fled from the hungry tyrannosaurus? That was through judicious use of SoftImage 3D (familiarly referred to as just “SoftImage”). Microsoft bought SoftImage in 1994, and just last year the Redmond giant sold them to Avid. During that time, the software stable had expanded to include SoftImage DS and Eddie (editing, compositing, and effects), and Toonz (digital ink and paint program for 2D cel animation). The operating platform also grew from being exclusively SGI-based to Windows NT — coincidentally, this last development took place during the time they were owned by Microsoft. Considering the modest size of the SoftImage product line, the work created with their tools has a surprising breadth across styles and media. The all-new, all-CGI Godzilla was created using SoftImage; the traditionally-animated Anastasia and Balto were inked and painted using Toonz; Hayao Miyazaki’s anime Princess Mononoke, which is second only to Titanic in the history of Japan’s box office revenue, made use of SoftImage 3D’s Toon Shader plug-in; and Mainframe’s ReBoot, War Planets, and Beast Wars all use SoftImage alongside other tools. Discreet Logic is a second-generation descendant of Tony de Peltrie; two of its four founders were originally from SoftImage. Literally around the corner from Taarna, Discreet Logic’s products, which feature such colorful names as flint, flame, and inferno, cover considerable ground: their software runs on Silicon Graphics, DEC Alpha, Windows 95, Windows NT and Macintosh platforms. More to the point, their software spans the complete production spectrum. To pick three examples, paint handles 2D animation and rotoscoping; effect is for compositing, effects, and motion tracking; light is a 3D rendering and animation package. By the time you read this, Discreet will have made industry headlines for winning the Scientific and Engineering Award from the Academy of Motion Picture Arts and Sciences. Hardly a surprise, considering that their products were used to great effect in such special effects extravaganzas as Armageddon, Small Soldiers, Titanic and Godzilla. Chris Landreth’s The End opened eyes when it came out in 1995. © Alias|Wavefront. Three hundred miles southwest of Tony de Peltrie’s progeny is Toronto-based Alias|Wavefront, which sits near Lake Ontario. The company has something of a quirky history. Alias Research and Wavefront Technologies were originally two separate companies: Alias focused on modeling, Wavefront in animating models. Both were founded in 1984 and had long histories of providing production tools for film (Alias had been used in Apollo 13, The Abyss and Judge Dredd; Wavefront in Mortal Kombat, Species and Akira). The two companies merged with Silicon Graphics in 1995. Although Alias|Wavefront’s various software runs on SGI, Windows NT and IBM RS/6000 platforms, the bulk of their product is, unsurprisingly, made for SGI systems, with Windows NT a distant second. The company’s first family of products falls under the banner of Maya, a rendering and animation suite that includes four modules: Artisan, FX, PowerModeler and Live. Two upcoming modules are Fur and Cloth, which, as their names imply, are used to mimic realistic fur and cloth behavior. Animation festival audiences have probably seen an eyeful of Alias|Wavefront’s software capabilities in Chris Landreth’s The End, and his more recent Bingo. Bingo, created using a combination of Alias|Wavefront software (Maya, StudioPaint 3D and Composer),features a fascinating blend of the real and the unreal; the protagonist is an ordinary-looking fellow, but the people and things that poke and prod at his sanity are deliciously surreal. What’s startling is that the protagonist actually does look ordinary — as in some of Landreth’s other work, there are times when our hero looks a little too human for a CGI creation, inching us a little closer to the idea of a “synthespian,” or digital actor. 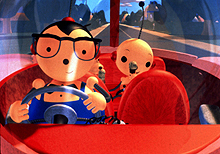 NELVANA’s Rolie Polie Olie utilized both Softimage and Alias|Wavefront products to complete the show. © NELVANA. One of the interesting aspects of the digital animation industry is that unlike most other computer-related markets, it’s hardly a zero-sum game. Studios can and do mix and match, using different tools for different aspects of the job. For example, Centropolis, the studio behind Godzilla, used SoftImage to bring Godzilla to life, and Discreet Logic’s software to composite the big lizard into the film. Mainframe uses SoftImage 3D as their base application, along with Taarna’s flesh and a host of other custom tools. Really, that’s what it boils down to: like any carpenter or mechanic’s toolbox, you can use what you need, so long as you know your tools are capable of handling the work. And as dozens of clients and audiences worldwide can testify, these digital tools from along the St. Lawrence Seaway can do the job. Emru Townsend is a freelance writer who won’t stop talking about cinema, animation and computers. He is also the founder and former editor of FPS, a magazine about animation. Thank you for posting this. After such an eventful week, listening and reading of people’s memories after the announcement of Softimage’s final release, I can’t help but think of my brother, so it was lovely to find this here. It made me happy that someone else remembers him and his love of Softimage, too.